Thanks! Ordered. I'm guessing this will see the light of day. Go Don May. Wow, it's pricey but very tempting. Sounds awesome. Sometime next year, perhaps. That's been the case for all of Synapse's other steelbook releases, I believe. I'm not sure if all of the extras will carry over, but I haven't really followed what Synapse has done there. Seems odd that the ad/announcement doesn't specify any of the extras as being new to this release. Are they all old? The retrospective is new. I don't know about the others. ^ Oops, yeah, misread that part. It being the only special feature mentioned as new reinforces my thought I already own that everything else. Although the remastering might make it a much better presentation; and the CD is remastered with extra tracks; and better subtitles, steelbook, and liner notes/booklet still make it tempting. I've always wanted to see Suspiria and I don't think the price point is bad considering it comes with the soundtrack which could run $20 on its own. I'm debating on whether I want to spend that much on a blind buy though. Check it out on YouTube. I found a couple full versions there, probably not legally, but you could sample it's uniqueness before taking a $50 plunge. Edit to add: It's on amazon Prime too. Last edited by Trevor; 08-26-17 at 01:06 PM. Might as well go for it. Once the SB sells out you can just resell it and get your money back if you want to. this is going to be one sweet release - got a tweet from the AFI Silver that they are hoping to announce soon the 4K DCP theatrical presentation(s) around Halloween. $50 is steep but I’ll make an exception for this movie. Big horror fan and this falls somewhere inside my top 10. Bit the bullet and got my order in as well. Folks, we gotta remember that this also comes with an exclusive remastered soundtrack that includes few bonus tracks. That definitely adds some value. 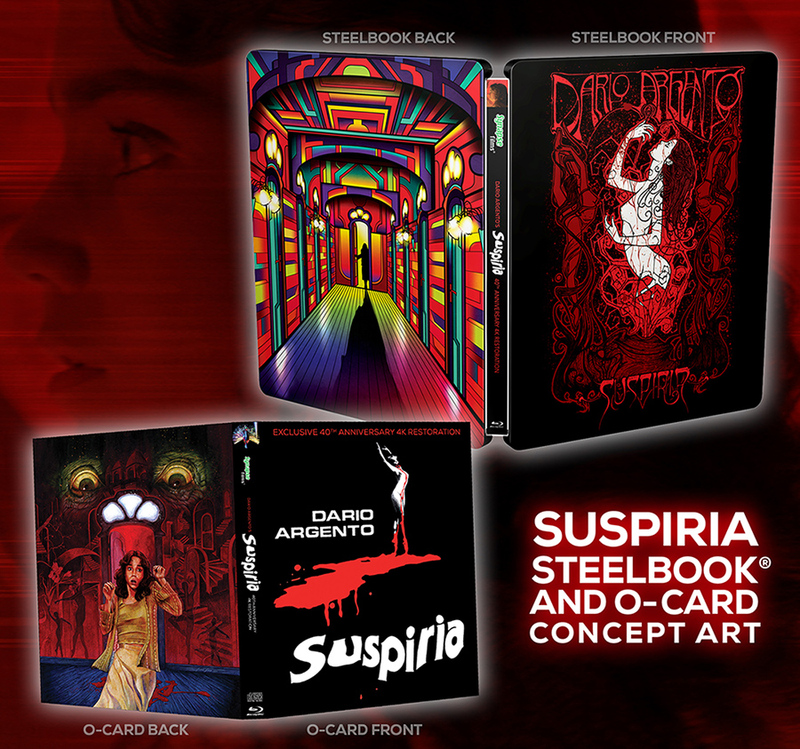 I have all the other Synapse steelbooks, they do a great job, and Suspiria is one of my favorites. This should look beautiful, I preordered, the hard part is now waiting. I usually don't spring for steelbooks or like to spend this much on a single title, but this is just such an anticipated release that I couldn't resist. My order has been placed. I just got back from seeing a screening of Synapse's 4k restoration and it was fantastic. The sound was loud and clear through the 4.0 stereo mix. The colors in the picture were vibrant and bright. I'm definitely looking forward to the Blu Ray. Props to Synapse Films for the great work. Word on the street is that they have somewhere under 1000 spots left for preorders. When does Synapse normally notify of remaining stock? 500? I think that's when they gave low quantity notifications for the Demons steelbooks. Thanks. Something tells me I should just bite the bullet and order it already. I kept putting it off for some reason. I need to order this as there is now a release date, but 12/31 is a Sunday so I suspect that even this date is more of a placeholder. I would prefer a more accurate release date before I actually pull the trigger as home video has almost always not (never?) been released on a Sunday. The date is a placeholder. The latest update is that the discs are being pressed and there aren't any delays. They will have a ship date once everything is 100%.